The range of our Baby Care Equipment includes Infant Incubators also. Our Baby Incubators are highly acclaimed in the international market for their superior quality. 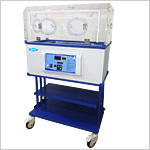 Available in Economy and Elite series, these Incubators are widely used in hospitals, nursing homes and other healthcare centres. Send Your Buy Requirement For "Infant Incubators" AND Get Quote Quickly.